Official prophecy has long foretold of a Jeep Hellcat, in the form of a 6.2-liter supercharged V8-powered Grand Cherokee, that will land right here in the real world very soon. But if this allegedly leaked official image is legit, the SUV’s not getting much in the way of visual tweaks. See, a high-performance variant of the Jeep Grand Cherokee already exists. Known simply as the SRT, the vehicle runs a naturally aspirated 6.4-liter V8 rated to a very healthy 475 horsepower and 470 lb-ft of torque. Around that angry stump-puller of a powerplant is an athletic interpretation of the Grand Cherokee body with some extra vents up front and in the hood, big wheels, huge brakes, and a low-hanging front bumper. 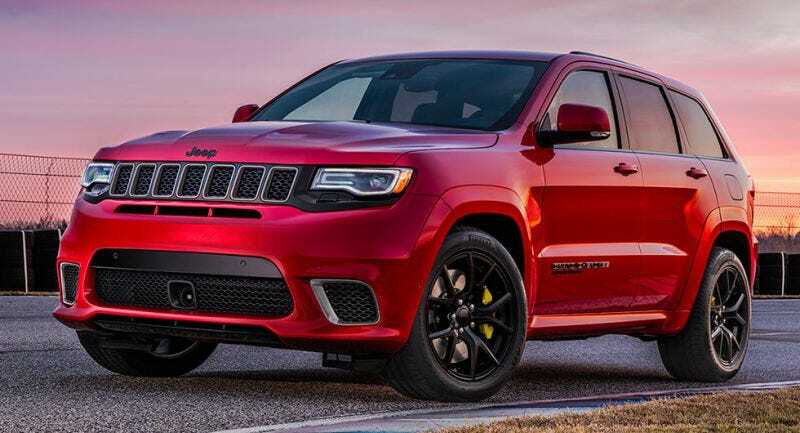 Today an image of a very similar vehicle popped up on Carscoops and the internet seems to think that this is the first official picture of the Trackhawk—which is what we know Jeep’s Hellcat-powered SUV will be called. The only appreciable difference between the Jeep in this picture and the current SRT model is a lack of foglights, some chrome trim and a badge that appears to read “SUPERCHARGED” right below “GRAND CHEROKEE” on the lower section of the door, which admittedly looks a little funny in this image. Here... I’ve laid the image of the alleged Trackhawk (dark red) over one of the current SRT (slightly darker red) for you to study. Spot many differences? We have reached out to Jeep for an official comment, but it’s Friday night and corporations generally don’t discuss products before press releases come out so I’m not expecting to hear back. Then again, they could be very different vehicles in performance and price while still looking similar outside. I have a feeling the exhaust note is going to be decidedly distinctive, nonetheless. Stay tuned next week, as I do believe we’re expecting to see the Trackhawk in its entirety at the 2017 New York Auto Show.